First of all, my apologies for the lateness of this posting. I thought I had already done this post and cued it for this morning (as all posts are set to publish at 8:00 am), but it appears that I spaced out this week. While I doubt many of you were sitting there hitting the refresh button on your browser all day and hoping for this post, I do like to keep my posting regular (much as I like to keep other, more personal things). The above is an adorable bit of packaging that Tirol is offering in preparation for the doll festival on March 3. 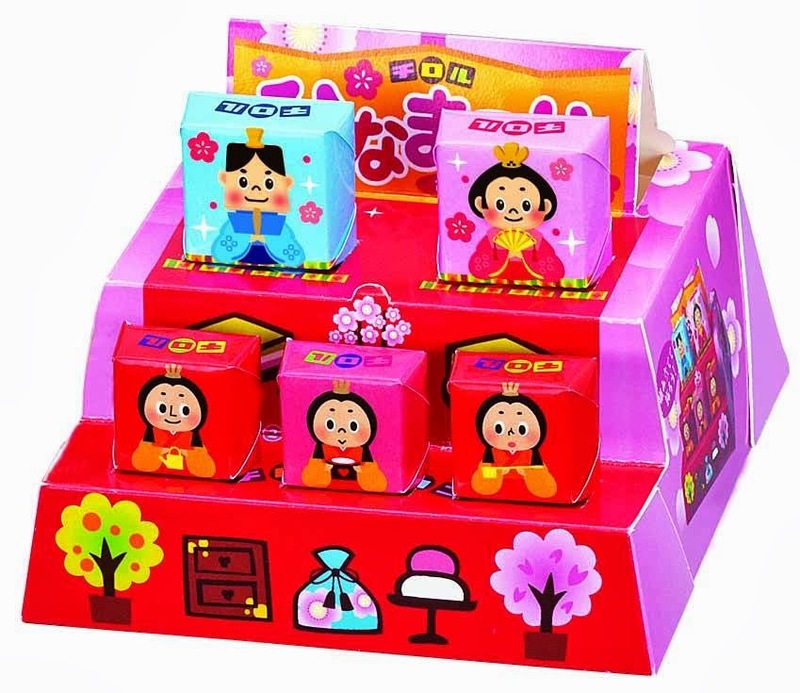 The box converts into a display and the chocolates serve as the dolls. The real deal is much more elaborate and expensive. I don't think this is meant to be a substitute, but just a little extra decoration or something that those who are nostalgic might want to set up and smile at before they devour the tiny candies. Since most of the doll sets, at least I'm told, run up to a thousand dollars (a lot of sets on Rakuten are in the $150-200 range), this would be the cheap way out, but, sadly, not particularly permanent. You couldn't hand these down to your own daughter. Yes, this is a lot cheaper than what I've seen of the big displays of dolls that cover a whole wall top to bottom practically. I think it would be great for apartment dwellers with no daughter or dolls, but then I'd wonder why they'd even bother with putting up any kind of display. I think just the cleverness of the set up is the real marketing tactic here. It does make me want to eat the doll chocolates, one by one, sort of like animal crackers inspire hunger in me. You can't see them and not eat (and therefore buy) them!